Whew, I was so happy to see Friday approaching on the calendar! I was called in for jury duty earlier this week, and then I also started a special summer position at work, supervising a work crew of 4 teenage boys for 10 hrs a day, 4 days a week. If that doesn't make a person desperately want Friday to arrive then nothing will, LOL. 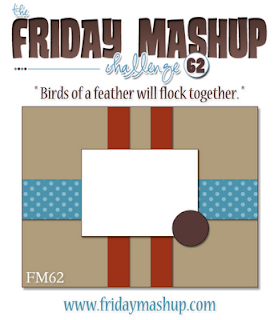 Its my turn again to host the Friday Mashup challenge and unlike my patriotic challenge, which sent everyone into hiding, I think this weeks is very simple and straightforward. All you have to do is use the sketch I provided, create a project that has a bird or birds on it, or mash it up and create a project with the sketch that also incorporates birds. I just adore birds and I can spend hours in my backyard and around the area with my camera, stalking some birds and waiting for THE picture! Right now I've got a pair of tree swallows nesting in my yard and I just adore their beautiful colors! Make sure you head over to The Friday Mashup blog, the rest of the design team came up with some awesome projects this week, I just love them all! Play along with us and show us what you've got this week! So pretty Lisa! Love the colours you've used - the dsp really pops against the indigo. Thanks for the fun challenge! I love your color palette on this. So glad Twitterpated DSP carried over! Oooh, love your color combo! This card is so pretty! Your punched flowers, leaves, and bird look great and I love the combination of colors and DSP you used! Thanks for sharing! 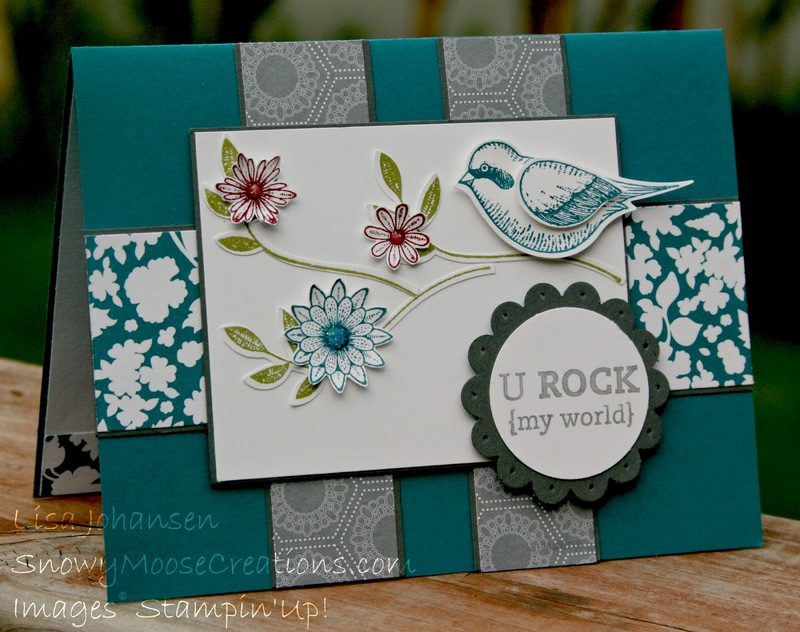 Such a pretty card Lisa! I love birds too, I've enjoyed your challenge this week a lot! I love your color combo. I Love the colors, the sketch, and that cute bird! Great challenge this week!